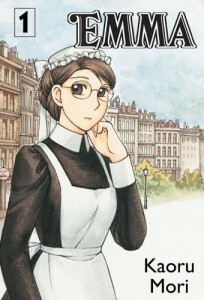 The manga tale Emma started in a Japanese monthly anthology called Comic Bean in 2002. It’s interesting to me that the author Kaoru references Sherlock Holmes as one of her favorite English things and her comic was presented serialized, the same way Sherlock Holmes was in Strand Magazine way back in 1891. When Emma, a house maid for an ex-governess, opens the door for Mr. Jones, a gentleman of English society, she not only bruises his nose, she captures his heart. This tale is not so much a love story between a servant and a gentleman, but a journey through the many “almost” moments Mr. Jones tries to show he cares for her. There is also a foreign traveler who comes to town and falls in love with Emma. The shop keepers, the postman, even the old men at the pub all lust over Emma. Why? She’s not so beautiful, she has murky brown hair and glasses. What is it about her that makes men of all ages stop in their tracks, run into poles, and stumble over their words? 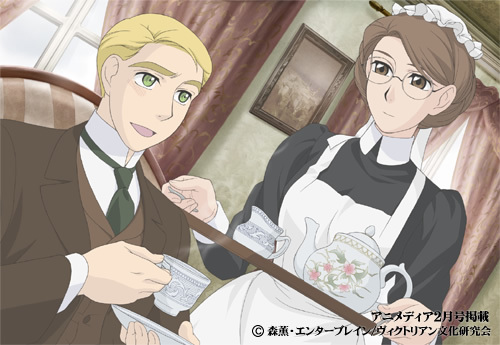 This series is more of a wish-fulfillment dream for plain Jane servants around the globe to read at tea. It was not wholly bad, but I didn’t find much in the story to intrigue me. The art is fabulous when it comes to architecture and interior design. I could stare at the pages of the Lending Library for hours. As for dress, it is very tame, Victorian England sort of suits and servant clothes. The arrival of Prince Hakim from India is somewhat interesting as it brings us new things too look at. Elephants, harem girls, shirtless servants, but even still I did not find his arrival that much of a milestone to coax me into buying the second volume. Unlike many manga, Emma is very stoic with not a trace of chibi influence. There is a lack of traditional thinking in some of the characters that I find out of place in a Victorian England period piece, but I think this little lapse will not deter anyone but the most hard-core Victorian England fan. This might be the only manga that I would enjoy as an anime, as it seems to have that sort of Jane Auten adapted for a movie kind of feel. I’m not sure the slight romance in this book will have Jane Austen fans clamoring to the bookstore, but it should entangle a few JA traditionalists that don’t care for blatant shows of affection. This is the perfect gift for a mom or grandma who likes to read the classics and a great starter manga for anyone who usually reads the classics. Emma Volume 1 contains five pages of author extras and can be found at Amazon.com.